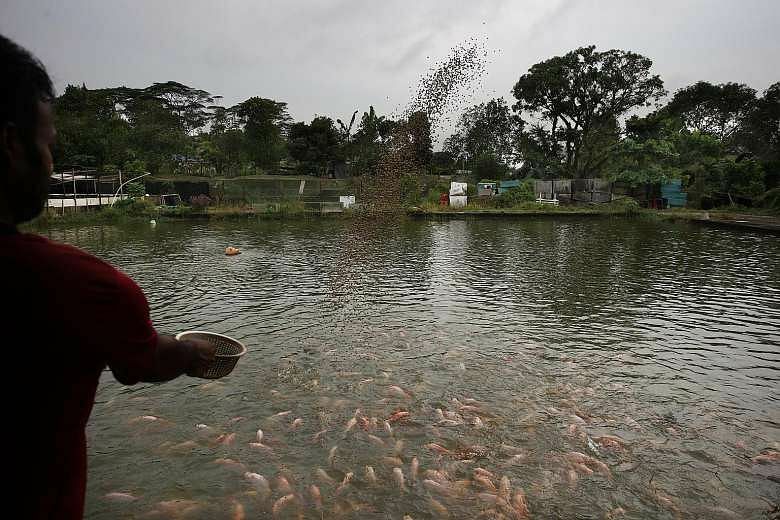 Some of the farms in Lim Chu Kang will be staying longer after yet another lease extension. While they need only move by 2021, the uncertainty of where they could continue their businesses makes planning for future growth difficult. The third time's the charm, or so the saying goes. But some farmers in Lim Chu Kang may beg to differ. About two weeks ago, they were told their leases had been extended by another two years to 2021 - the third extension in four years. But while their rice bowls can continue feeding them for the extra years, farmers say they are caught in limbo as the repeated extensions add uncertainty - it would be too risky to plough investments into a plot of land with an expiry date. Many simply end up playing a waiting game. The agricultural sector is small, contributing to less than 10 per cent of total food supply. But local food production is still vital for food security. Despite this, uncertainties plague the industry. For instance, even though some farmers in Lim Chu Kang knew they had to move from as early as 2013, it was not until earlier this month that the authorities announced details of the location and size of the new plots of farm land available for bidding. A total of 36 new plots of farmland spanning 60ha will be up for tender in several tranches from August this year. The new plots are in Lim Chu Kang and Sungei Tengah, not far from the current farms. 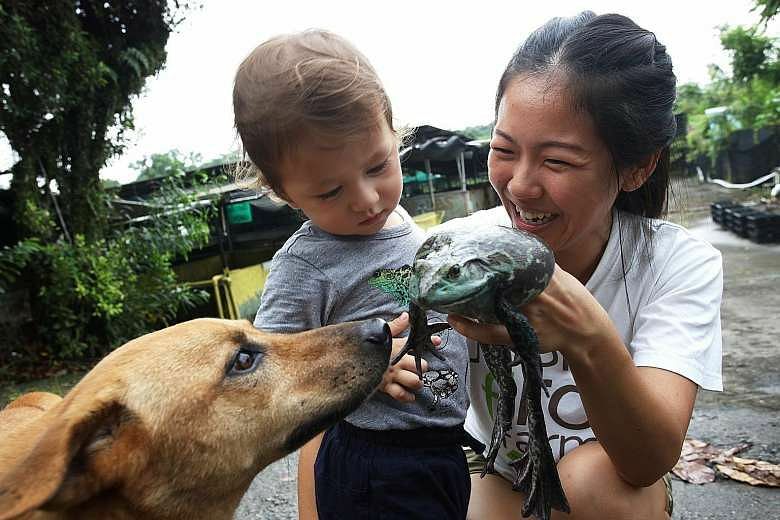 As Ms Chelsea Wan, 32, of Jurong Frog Farm puts it: "If there had been more certainty, and our time not extended bit by bit over the years, our morale wouldn't have taken such a big hit and we would have done much more." The extra years could have made investing in a customised recirculating aquaculture system designed to improve water quality for the bullfrogs worthwhile, said Ms Wan, who is a director at Singapore's only American bullfrog breeding farm. The original lease on Ms Wan's farm, founded in Jurong by her father Wan Bock Thiaw in 1981, had initially been due to expire in November 2013. Reprieve came that month, when the authorities gave her farm a three-year lease extension to November last year. September 2014: 62 farms in Lim Chu Kang are told they will have to move out between 2017 and 2021 when their leases expire. They are told that the tract of land will be converted into military training grounds. Farms whose leases run out between 2014 and early 2017 are given an extension until June 2017. June 2016: Farms whose leases run out in June 2017 are given an extension by 2½ years to end 2019. This month: The Agri-Food and Veterinary Authority of Singapore (AVA) announces that it will tender out 36 new plots of farmland in Lim Chu Kang and Sungei Tengah on 20-year leases from August. AVA said experienced farmers with good track records awho are willing to adopt high-tech farming methods will stand a good chance of winning their bids. Some farms are given a third lease extension, by two years, to 2021. A month before that deadline, the frog farm received a second lifeline in a letter informing them of a "final extension" till November 2019. The latest letter with the 2021 deadline is the third received by Jurong Frog Farm since 2013, and the second one indicating a "final extension", said Ms Wan. In response to queries, the Agri-Food and Veterinary Authority (AVA) said the 2021 deadline "will be the final lease extension". Ms Wan's farm was one of 62 which will have to move to make way for new military training grounds. She is still mulling over whether to bid for the new farmland tender in August. At nearby goat farm Hay Dairies, farmer John Hay, 62, is wondering whether the latest extension could mean that it can stay put. "What if by the time 2021 comes around, the Government tells me that I can stay?" he said. The AVA had said that experienced farmers with a good track record and who are willing to adopt high-tech farming methods to boost productivity and use of labour will stand a good chance of winning their bids. Still, he plans to bid for new land when it comes up for tender, and his son Leon Hay, 38, has other ideas to boost productivity, including bringing in more goats and expanding from milk to other products, such as yogurt and ice cream. But the younger Mr Hay said of the uncertainty surrounding the extension: "Even if we are successful in bidding for new land, can the Government ensure that our current plot of land will not be re-tendered once we move out?" The letter informing farmers of the 2021 deadline, which The Sunday Times has seen, said that the extension would give them "sufficient time to transit to the new farm land if you bid successfully in the upcoming tenders by AVA". But not all the farms which would have needed to vacate by end-2019 received this. Quan Fa Organic Farm located at 35 Murai Farmway, off Lim Chu Kang Road, for example, did not receive the extension, said Mr Fabian Liao, sales and operations manager at the family-run vegetable farm. In response, AVA would only say that Quan Fa is not in Lim Chu Kang, and that "farms should plan their business based on their existing lease for business sustainability". In other countries, the future of farming depends on whether there are members of the younger generation who are willing to become farmers, said the elder Mr Hay. "In Singapore, we have younger people stepping up. But we may not have the land for them." 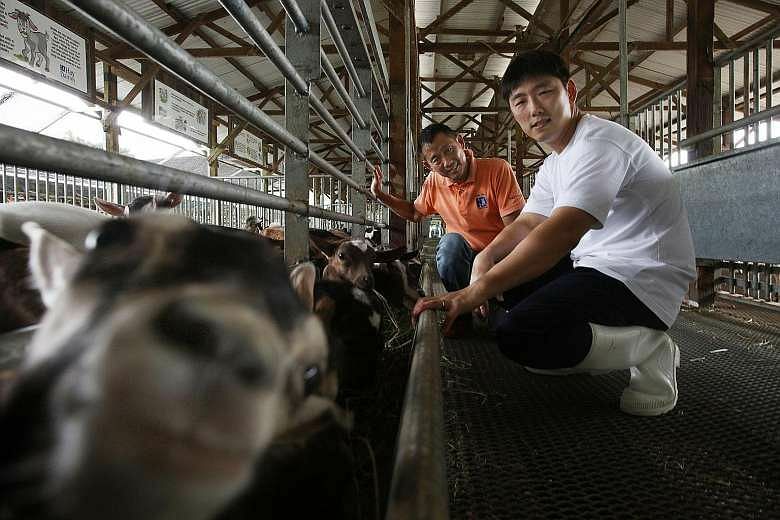 But Mr Kenny Eng, president of the Kranji Countryside Association that represents about 40 farms, believes the agriculture sector here could grow - provided the right support is given. "I think this additional two years gives us the assurance that the Government is seriously looking at this as an industry right now, but there is still more work to be done."